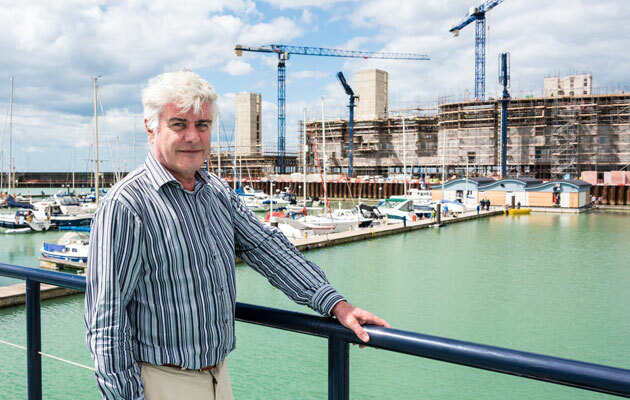 The new home for Brighton Marina Yacht Club (BMYC) at 3500 ft, is one of the country’s largest floating buildings. It was moved to its permanent moorings at the city’s marina on 30 July 201§5 and it will now be fitted out and open for members and guests in September, when BMYC is also running a new series of its Club Class introduction to yacht racing sessions. Club Class has introduced hundreds of local people of all ages and abilities to the sport over the years, and has been praised by the Royal Yachting Association as a model for other clubs to follow. BMYC has to leave its current premises as redevelopment of the marina into a world-class destination accelerates. Its new home is the result of collaboration between Brunswick Developments (who, as part of the new 850 apartment, Outer Harbour Marina Development, funded the construction and provided the building for the yacht club), Intermarine (who have engineered and built the new clubhouse and its innovative floating platform) and Premier Marinas (who have provided its permanent mooring adjacent the Marina boardwalk). The distinctive wave design of the building was conceived by club member and local architect Stewart Henton. Aided by international interior designer Cary Terlezki, the Club is now putting the finishing touches to the facility and it will be ready to welcome new and old members in September.